Travelling the John Hart Peace River Highway from Prince George to Dawson Creek, BC for an overnight stop. Our summer adventure was under way and we were enjoying perfect summer days that we expect in BC. We had temperatures of 24C (75f) with blue skies and sunshine that make the incredible scenery even better. There were many miles of tree lined roads ahead of us. This area was not new to us as we’d been this way before. What was new was the recovery from the Pine beetle destruction that had been seen on our last trip up here. New growth, green trees, so much nicer! Simon Fraser was the explorer who opened a trading post at Fort McLeod to offer the opportunities for trading to be done much easier as well as getting supplies west of the Rocky Mountains in 1805. The Hudson’s Bay Company bought that in 1821 and it was still there over one hundred years later. We stopped to see the Historic monument and were disappointed at how there had been nothing done to tidy up the area. None of us had ever been into Mackenzie before so we decided to take the short 29 km. trip up Hwy 39 to see what we’d only heard about. 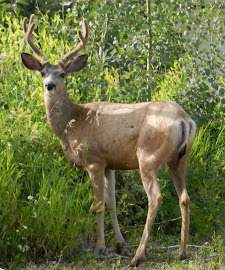 McKenzie was named after the earliest known explorer of Canada west of the Rockies. Sir Alexander Mackenzie, a surveryor as well, camped near here in 1793, long before the town ever existed. The instant town of Mackenzie was developed in the 60’s to service the pulp and lumber industry growing in this area. This Tree Crusher, the only self- powered one of its’ size and designed for land clearing was relocated by the Municipality of Mackenzie and set up at its’ present location as a tourist attraction in 1984. The Pine Pass is a part of the Hart Ranges of the Northern Rockies. It is the lowest at an elevation of 875 m. (2871’) and the most northern of the passes through the Rockies between British Columbia and Alberta. It is the only one that does not connect the two provinces. This part of Hwy 97 between Prince George and Dawson Creek, BC is the John Hart Highway and was completed in 1952. There is a pullout not far from the Powder King Ski Resort turnoff where we parked to get a good look and photos of the Pine River below. Chetwynd, with a population around 3100 is in the Peace River Country which offers so many activities like fishing, hunting, skiing and much more. This small village is the host for the Chetwynd International Chainsaw Competition. This brings world class carvers to the annual event and we were able to see the results of many of them. 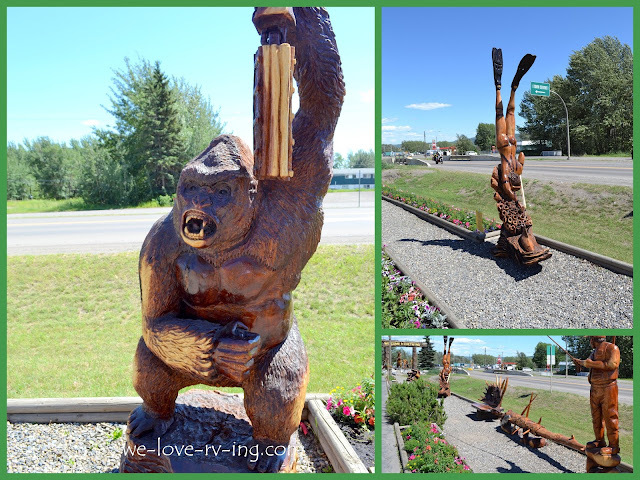 There are over 60 wooden sculptures along the highway through town. The first carvings were done to celebrate the 50th Anniversary of the Alaska Highway. We stopped to enjoy some of these carvings up close and here is a sample of those we saw. We’ve arrived at the city of Dawson Creek, BC, which is in a very prairie like part of the Peace River country. We’ve spent time here before with work so we are quite familiar with the area. 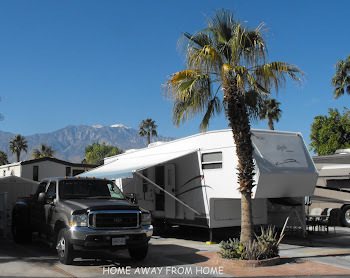 No sightseeing trips are planned, we just set up camp in a local RV park and relax. We are looking forward to an evening visit with our grandson who happens to be working here at this time, the highlight of an already great day. Click here for another day of adventure on our travels.